Written on May 29, 2007 by Kevin. Everyday you hear another report saying that one food or another is bad for you and your kids. My wife and I have made a conscious effort to try and eat better. Our intake of soda is next to none and things like trans fat and high fructose corn syrup have been minimized. We believe this is also setting Rylan up for better health as well. When Dan, from the TrueBlue™ company, contacted me about sampling and reviewing their fruit juice cocktail I was a bit thrown off but quickly saw the benefits(blueberries are considered a superfood) for me and my family. Last week we received 8 bottles of TrueBlue™ Blueberry Blackberry juice and quickly jumped into it. TrueBlue™ contains no high fructose corn syrup. Instead, they use cane sugar which is great alternative. I sat Rylan down and made him a cup. 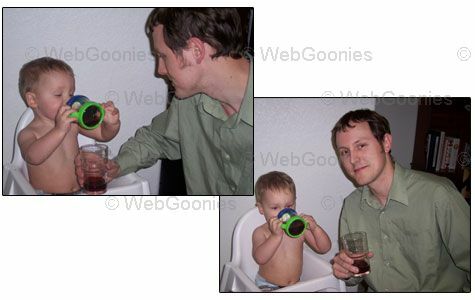 He was reluctant at first to try something new but it only took a bit of time before he was gulping it down. This stuff is great. Many juices on the market have a very strong fruity flavor but this one is not that way. The best way that I can describe it is that it is very light feeling and not thick. The flavor is suttle and perfect for those who do not like super sugary tasting drinks. It has been less than a week now since we received our bottles and looking in the pantry shows that we have already drank half of the 8 bottles. As all fruity drinks do, this juice does have a decent amount of sugar at 26g. With 25% less sugar and calories than other juices though, this is a healthier alternative. In an 8oz glass, you receive 100% of your Vitamin C intake which is always beneficial especially around cold season. Overall, we are extremely pleased with the TrueBlue™ Blueberry Blackberry juice. I look forward to tracking this product down at our local grocery stores and trying some of the other flavors including Blueberry Green Tea and Blueberry Pomegranate. Click here for a free $1.00 off coupon and if you cannot seem to find a TrueBlue™ at your local stores click here for a bit of help. While we will still not give Rylan too much juice (he loves simple water), I feel OK giving him a cup of this TrueBlue™ juice daily. The other juices on the market are filled with so many unnecessary things that it can make you cringe. I want to thank Dan from TrueBlue™ for giving me the opportunity to review the fruit juice. Rylan always loves trying out new things and this appears to have gotten the thumbs up from him. My wife and I both loved it as well. The only negative that I found to this juice was that I cannot yet find it in my local stores. With as many as 4 awards won last year, I am confused why its not on every markets shelves. I've not heard of this brand but, based on your endorsement, I'm going to go look for it!